2018 Beta XTrainer first look! Following the success of the first model, the new XTrainer 300 is now on the market. Its many new features include a fully updated engine. Engine updates that were introduced in the 2018 RR 2-stroke range have been shared with the XTrainer to further improve its performance and reduce its weight. These important technical innovations put the new XTrainer in a particular niche of the Enduro market, making it the perfect choice for those looking for a 2-stroke bike with slightly softer power delivery while still offering excellent ride-ability and ease of use. Definition; FUN. 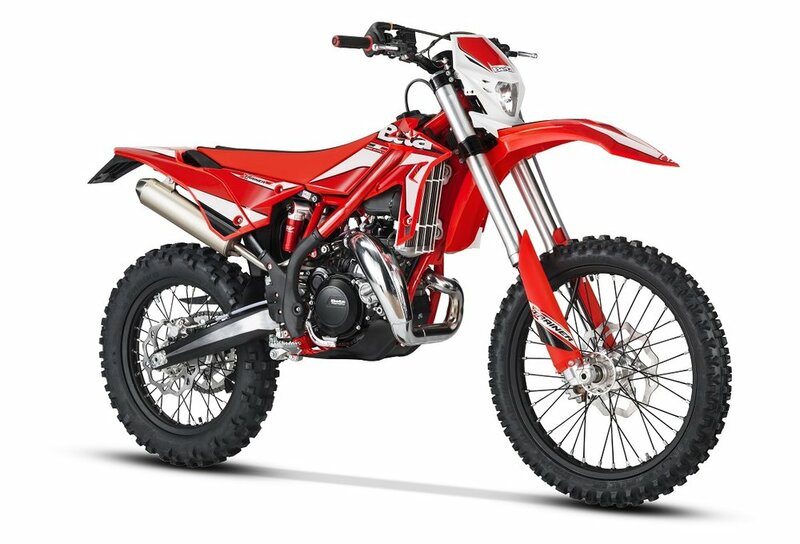 In fact, this is a bike for Enduro newcomers and those who want an off-roader that is a less demanding ride, not too heavy and still provides comfort and performance at a reasonable cost. The XTrainer is also a great option for the Extreme Enduro discipline. -Power delivery: soft and linear, making it extremely easy to ride, yet enough to inspire. -Beta Progressive Power Valve: allowing excellent engine performance throughout the rev range thanks to easy external adjustment via a 5mm hex wrench. -Seat height: reduced to 910 mm (35.8") - compared to the 930 mm (36.6") of the RR range to ensure an even more comfortable ride. -Low weight: at only 98 kg (216 lbs.) which provides an agile and non-intimidating ride, even for newcomers. -Automatic oil injection: eliminates the need for a fuel-oil premix. -Soft tires: to ensure better grip and higher performance on slippery terrain. The stable, light perimeter frame, coupled with a 43mm progressive fork and a dedicated single shock, houses a cutting-edge, tamed-down Beta 300cc 2-stroke engine. -New clutch: a total overhaul has produced a lighter, more compact 6-spring clutch that improves its engagement, precision and stability as operating temperatures change. A new design to the clutch cover is more streamlined and stylish. -New gear shift system: improves the precision of the transmission and eliminates any uncertain mis-shifts. -New cylinder: new two-piece design for closer machining of the power valve increases performance in terms of power and torque throughout the rev range while keeping the power delivery perfectly linear. -Domed piston and new cylinder head profile: together with the new cylinder, these increase engine performance and improve running at low revs. -Crankshaft: rotating mass values were revised to match the new features of the engine and the crank pin was reinforced to improve reliability. -New connecting rod: reinforced lower bearing area to reduce friction and heat while improving reliability. -New BPV centrifuge: with larger spheres to better adapt to the new primary drive ratio, ensuring better power delivery. -New combustion chamber: a slight increase in compression ratio has boosted performance. *Plus $379.00 destination, sales tax, and other dealer license fees.